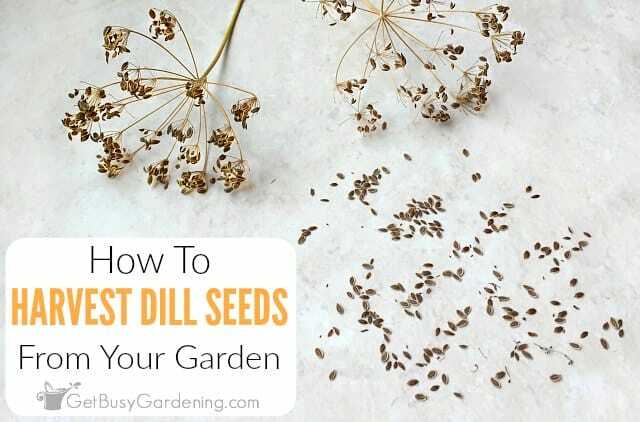 Saving dill seeds from your garden is easy and frugal! 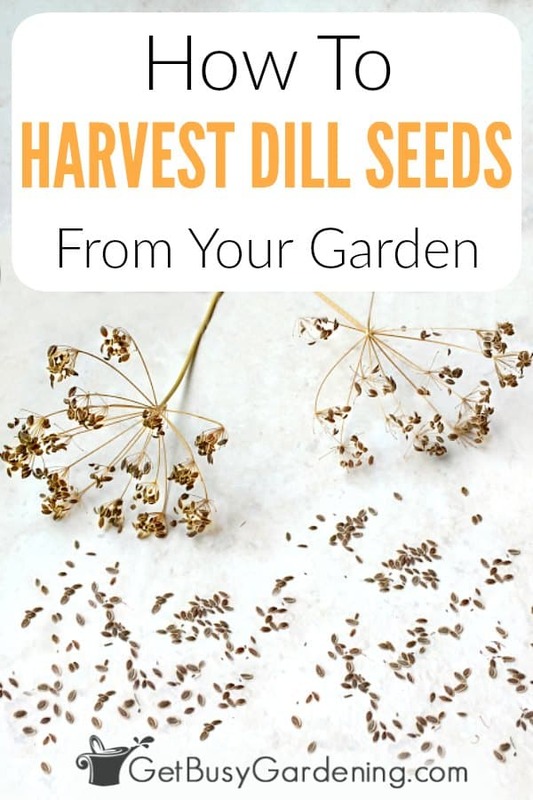 In this post, I will show you exactly when and how to harvest dill seeds, and what to do with dill seeds after you’re done collecting them. Dill is a popular herb that many gardeners grow in their garden every summer. Dill’s an annual herb that can be used in tons of recipes and, of course, it’s essential for making dill pickles. It’s also a host plant for the swallowtail butterfly caterpillar. 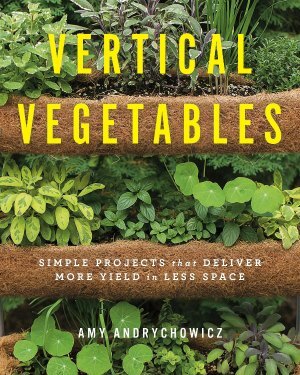 So, even if you don’t love to eat dill, it’s still an essential herb to include in every vegetable garden. The best part about dill? 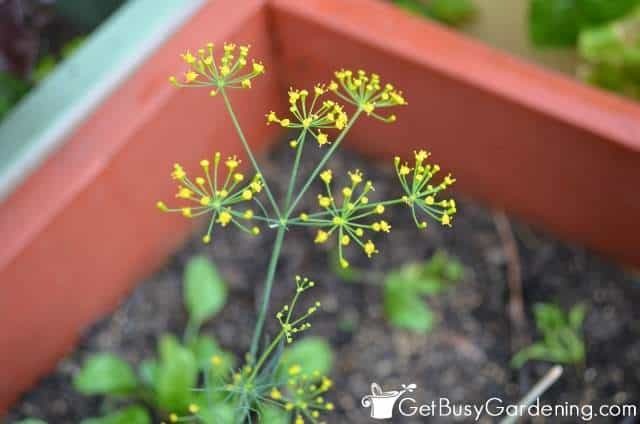 It’s easy to collect dill seeds, so you can grow it in your garden year after year. I like to collect several types of seeds from my garden every year, and dill is one of my favorites. Many times you don’t even have to collect dill seeds, sometimes they will readily reseed themselves with no help from you. 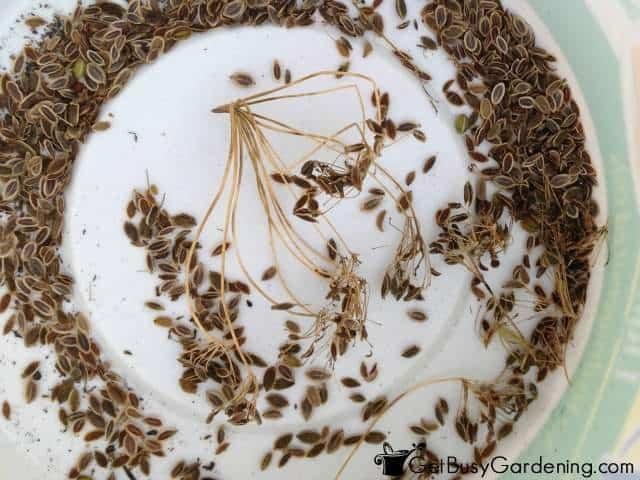 But, if you want to make sure that you have plenty of dill seed for planting next year, then you’ll definitely want to take a little time to harvest dill seeds. In order for the dill plant to set seed, it must first bolt (i.e. : flower). So, if you want to be able to harvest dill seeds from your garden, allow a few of your plants to flower. 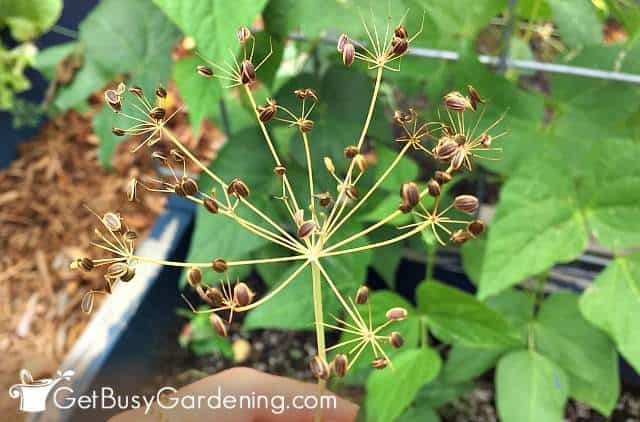 Once the flowers fade, the dill seeds will start to form at the tips of the star shaped flower stems. 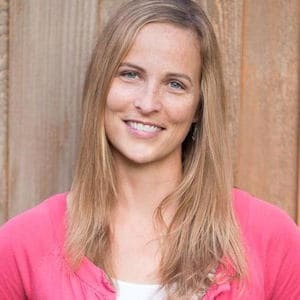 Allow the seeds to dry on the plant, but don’t leave dill seeds on the plant too long or they will eventually blow away. What Do Dill Seeds Look Like? Dill seeds are flat and oval shaped. They are grayish-brown in color, with lighter colored stripes running the length of the seed, and also around the outer edge of the seeds. The easiest way to harvest dill seed is to clip the entire flower head from the plant, and dropping them into a paper bag or bucket. 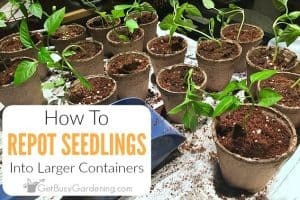 You may want to clip it off over a container because the seeds can start to drop from the plant when it’s disturbed. Then you can collect dill seeds by gently pinching them off, or by shaking the bag or bucket the flower heads are in. Some of the seeds will come off easily, while others will want to hold on. So sometimes it can be a bit tedious to get every single dill seed. You can plant your dill seeds right away, or save them for planting next year. Just be sure to allow your dill seeds to dry out completely before storing them. 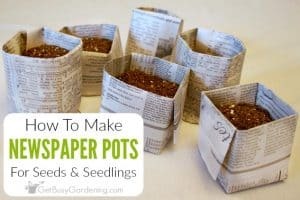 Once your seeds have completely dried out, store them in a plastic container (film canisters are the perfect size! ), a paper bag, or use small envelopes. If you want to share your dill seeds with friends, you can buy customized envelopes, or make your own DIY seed envelopes. I store my seeds in clear plastic containers, but if you’re more organized than I am, you will love a Seed Keeper. You should be able to find dill seeds for sale at your local garden center during the winter-spring months. Otherwise, you can buy dill seeds online any time of the year. Here are some great, quality seeds you can buy to get started… dill herb seeds. If you love growing dill, take a little time to collect and store dill seeds from your garden. They are fun to share with friends or trade for other seeds – and best of all, you’ll never have to buy dill seeds again! 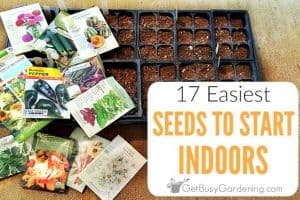 If you’re new to growing seeds, and want to learn how to start seeds indoors, then my Starting Seeds Indoors eBook would be perfect for you! 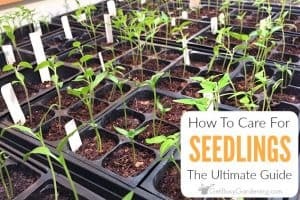 It’s an easy, quick-start guide that will have you growing your own seeds in no time. Download your copy today! Share you tips for how to harvest dill seed from your garden in the comments section below. I love Dill … I know most people make Tomato Basil soup, but Tomato Dill is even better in my opinion. I live in Nebraska, where the winters can be pretty rough. How do I get my dill stalks ready for the winter. Do I cut them down a few inches to the ground? Thank you. Dill is an annual herb. So that means that the plant will die this year, and you’ll need to grow new ones next year. It doesn’t come back from the same plant year after year. It’s easy to grow from seed though. I just spread the seeds in the garden in the fall, and have tons of dill spring through fall. Or you can harvest dill seeds and save them for planting next year.